Home » Investor News » How to Ride the Coming Financial Storm! As I write this, Hurricane Florence is about to slam into the U.S. East Coast. And this stormy weather makes me think about something else. Something that could be very profitable … for you. Hurricane Florence is a gentle breeze compared to the financial storm that is marching toward our shores, a storm that will hit with the force of a million sledgehammers. For a while now, Martin Weiss has warned us about a tidal wave of debt that is going to drown markets around the world before finally washing up on U.S. shores. Well, we are seeing some urgent warning beacons. Beacons with names like Turkey and Argentina. And all signs are that this storm is going to get worse. And these are just pieces of a bigger picture. Total global debt is a whopping $169 trillion. That’s up from $97 trillion on the eve of the Great Recession. That’s according to the McKinsey Global Institute. To be sure, debt doesn’t matter until it matters. After all, the U.S. has $21.2 trillion in debt. And our markets and economy are humming along. Even though, in just the first nine months of the year, interest on that debt, paid by the U.S. government, increased by an additional $40 billion year over year. Just the interest alone on the debt is now a half-trillion dollars a year. Horrific! This is partly due to the fact that the U.S. now goes deeper in debt to the tune of a trillion dollars a year. But it’s also due to rising interest rates. The trends are ominous. Storm clouds are building higher and higher. And yet, the U.S. market keeps tootling along. Indeed, as growth in emerging markets seems to be downshifting, the U.S. is accelerating. Real gross domestic product growth for the second quarter was just revised up to 4.2 percent. And our “honey badger” market shakes off bad news. And no wonder. Scared by the global storm, money from around the world is flooding into U.S. stocks. Meanwhile, out where the real storm is brewing, those beacons keep going off. Turkey … Argentina … and now South Africa are seeing funds bolt and their stock markets plunge. South Korea is starting to flash its own warning. Mexico is OK … for now. But don’t think it’s safe, either. That looks bad, and it’s getting worse. Those EM currencies are getting shredded. The MSCI Emerging Markets currency index recently hit its lowest level since May 2017. Many on Wall Street will tell you to buy the dip. Anyone who tells you that is an utter fool. Or maybe he wants to sell you the bag he’s holding. Can this get worse? Hell yeah, this can get worse. In fact, I expect it to get worse. We’ll see the flow of funds in global markets follow the crisis map Martin has laid out. You can either heed the warning he has sounded about this, or you wait to dogpaddle as that wave comes in and drowns you. I recently sent my subscribers a report called “Fishing Ahead of the Tsunami.” Because there are ways to make money ahead of this crisis. That’s what you should be doing. Curling up under your desk is not an option. You better get busy, because while that tsunami of debt is certainly coming — and leaving havoc in its wake — it’s still a ways off. And if you’re a stock speculator, there is another opportunity. 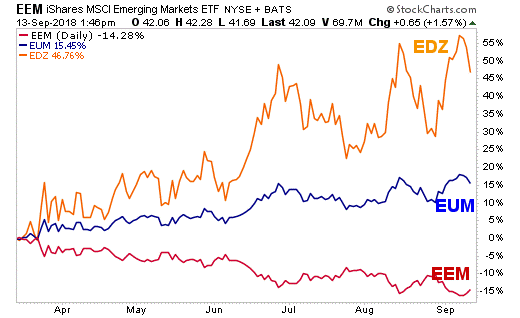 You can use an inverse fund that goes higher as emerging market stocks go lower. An obvious pick would be the Short MSCI Emerging Markets ProShares (NYSE: EUM). It has an average volume of more than 639,000 shares per day. That’s plenty liquid. And if you’ve got a spine of steel — and cajones to match — you could use the Direxion Daily Emerging Markets Bear 3X Shares (NYSE: EDZ). That’s a TRIPLE inverse fund. Too wild for me — I like to sleep at night. But for certain speculators, those who crave volatility and potentially out-of-the-ballpark payoffs, it’s just the ticket. Look at this chart comparing the performance of these three funds over the last six months. The iShares MSCI Emerging Markets ETF (NYSE: EEM) has lost 14.27 percent in the past 6 months. Terrible. No surprise, then, that the Short MSCI Emerging Markets ProShares (NYSE: EUM) has gained 15.51 percent at the same time. And that triple-leveraged Direxion Daily Emerging Markets Bear 3X Shares (NYSE: EDZ) is up a hefty 46.76 percent. Nice. Again, I don’t think this trend is over. I think it’s going to get worse. Hurricane Florence is a gentle breeze compared to the financial storm that is marching toward our shores, a storm that will hit with the force of a million sledgehammers. You can ride this storm, and profit from it. Or you can sit on your hands until the wave is washing over you. The choice is yours. P.S. In early November, I’ll be speaking at the New Orleans 2018 Investment Conference. It will be a great show, with all sorts of experts sharing their insights. And I’ll give my best picks. You can find more about that incredible conference HERE. I hope to see you there!